What do you do when the threat of government regulation is heading your way? If you’re the alcohol industry, you introduce new ‘rules’ to give the appearance that you care about controlling the placement of your marketing, but design them carefully so they actually do very little to shift the status quo. The industry’s ABAC Scheme has updated their content code to include ‘Placement Rules’. In summary, the rules require alcohol advertisers to comply with existing placement codes (for example, the Commercial Television Industry Code of Practice and Outdoor Media Association Alcohol Guidelines); use age restriction controls where available to exclude minors; place ads only where the audience is reasonably expected to comprise at least 75% adults; avoid placing ads with programs or content primarily aimed at minors; and avoid sending alcohol ads to minors via e-mail. They’re hardly the “cutting-edge” or “robust and effective” rules that ABAC tried to make them out to be. These new rules are unlikely to reduce young people’s exposure to alcohol ads in any meaningful way. It’s no wonder industry groups, such as Alcohol Beverages Australia and the Winemakers’ Federation, have enthusiastically welcomed them. Consider, for example, the new ‘rule’ that alcohol ads may only be placed where the audience is reasonably expected to comprise at least 75% adults on television, digital, radio, cinema or print media. For starters, young people aged 0 – 17 years only account for around 22% of the Australian population. If you then take out the babies and little kids, less than 10% of the population are aged 10 – 17 years. It would need to be a very child-oriented program to exceed the 25% threshold for minors. But even a seemingly modest proportion of the TV audience can represent hundreds of thousands of young viewers. For example, OzTam TV viewing data from 2016-17 indicates that 266,000 young people aged 0 – 17 years watched the Masterchef Grand Finale, which represented 15% of the audience. That’s still a lot of kids. International research suggests that voluntary audience threshold restrictions are too permissive to meaningfully protect large numbers of young people from exposure, difficult and expensive to monitor, and breaches occur. 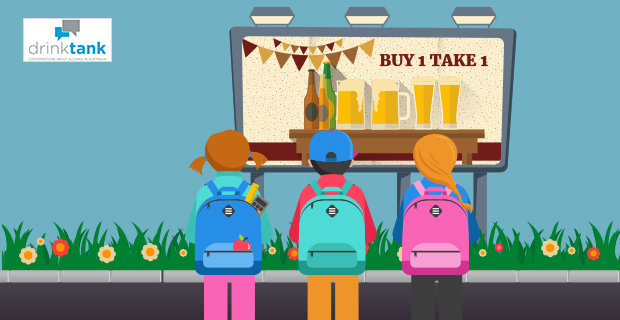 The use of woolly wording such as “primarily aimed at minors” means that alcohol advertising can continue in programs that are popular with young people but are not necessarily ‘primarily aimed’ at them. So, as long as programs are popular with adults as well as kids, it’s ok to advertise alcohol in them. The new rules don’t address significant gaps and weaknesses in the self-regulatory system. For example, the ABAC Code still does not apply to alcohol sponsorship; there are no restrictions on alcohol ads in outdoor media (e.g. billboards, bus stops) except within 150m of a school gate; the loophole allowing alcohol ads in weekend sport on TV remains; and there are no penalties for advertisers who breach the code. ABAC have even added a fun new ‘no fault breach’ clause which appears to allow alcohol advertisers to pass the blame and responsibility to someone else for breaches. More good news for alcohol advertisers! Release ‘best practice advice for responsible digital marketing of alcohol’ in 2013 and a ‘strengthened’ code in 2014. While ABAC may claim they’re addressing community concerns around alcohol marketing, all signs point to a fear of government regulation. Failure to cover placement has long been a criticism of ABAC. Given how weak the new ‘placement rules’ are, this criticism largely stands. There is a clear need for comprehensive controls on the content, placement and volume of alcohol marketing, but alcohol advertisers should not be the ones designing those controls. Don’t be fooled by the window dressing. Thanks for the article Julia and Hannah. The alcohol industry is only interested in one thing: selling more of their product. As any reasonably informed person knows, self regulation in any industry has failed. Just turn your minds to the Grenfell Tower disaster as a more extreme example of lost lives due to self regulation failure. Let’s not forget that alcohol also kills. The literature is very strong in demonstrating that young people who have greater exposure to alcohol marketing appear to be more likely subsequently to initiate alcohol use and engage in binge and hazardous drinking. key strategy of the alcohol industry. The International Center for Alcohol Policies (ICAP) was a Washington-based organisation that was set up in 1995 by ten of the world’s largest distilled spirits and beer marketers to counter the alcohol policy direction of WHO. Internal documents from Phillip Morris (which then owned Miller Brewing and which retains a significant shareholding in the merged SAB-Miller) revealed that they formed ICAP with the explicit objective of influencing policy. In April 2014, ICAP merged with the Global Alcohol Producers Group to form the International Alliance for Responsible Drinking. Essentially, IARD’s mission seems to be to reframe alcohol policy away from policy that minimises harm towards policy that promotes the positive aspects of alcohol consumption. They argue strenuously that self regulation is an effective means of reducing harm from alcohol consumption. As a follow up for those interested in advertising and alcohol I recommend a study by the AMMIE project (Alcohol Marketing Monitoring in Europe)”Key findings of independent monitoring of alcohol marketing in five European countries”. This is another alcohol industry charade, but how does public health prod governments’ into taking the shortcomings of these industry self-regulatory systems seriously?